"The Internet Pinball Machine Database — also known as the IPDB — is a comprehensive, searchable encyclopedia of virtually every pinball machine ever commercially made. The database currently includes 66,594 images of 6,074 games, 4,609 other game related files, and links to other pinball websites, grouped by machine. The database also includes pitch & bat baseball games, cocktail table machines, bingos, and payout machines ... when they have a pinball theme. The data in this database has been laboriously gathered by the Editors over many years, from books, photographs, flyers, web sites, pinball manufacturers, collectors' personal records, and of course the pinball machines themselves. Most of the actual photographs in the database came from various collectors – over 2,372 different contributors to date." l hope anyone that needs info on old marble games finds it useful. It's cool whether you like pinball games in general or whether you only want marble-themed ones. That is just cool, Steph! 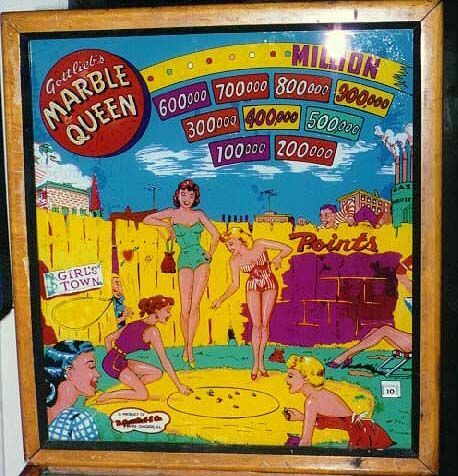 Though I love all pinball games - oh, the quarters I threw down years ago in Fireball and Satin Doll, and I have a couple vintage ones on a wall - I never thought to search on there for a marble themed one!